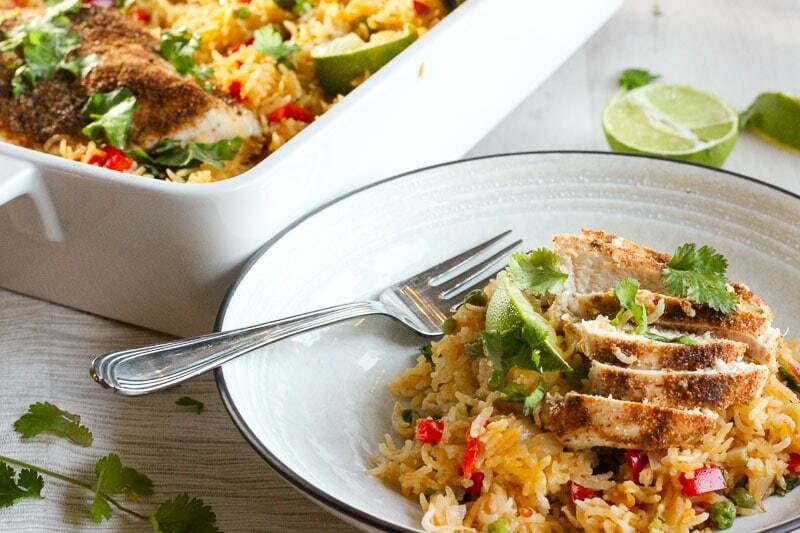 This One Pan THAI Chicken and Rice Bake is easy, healthy comfort food – one of the best meals for families, without a ton of dishes to clean! 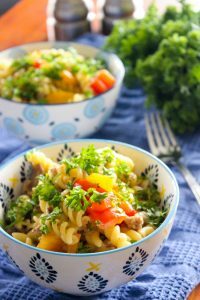 It’ll become one of your favourite easy dinners! Also, it’s the best rice I’ve EVER eaten! I love an easy supper (dinner?) as much as the next person, but it still has to be GOOD. Preferably, REALLY good. 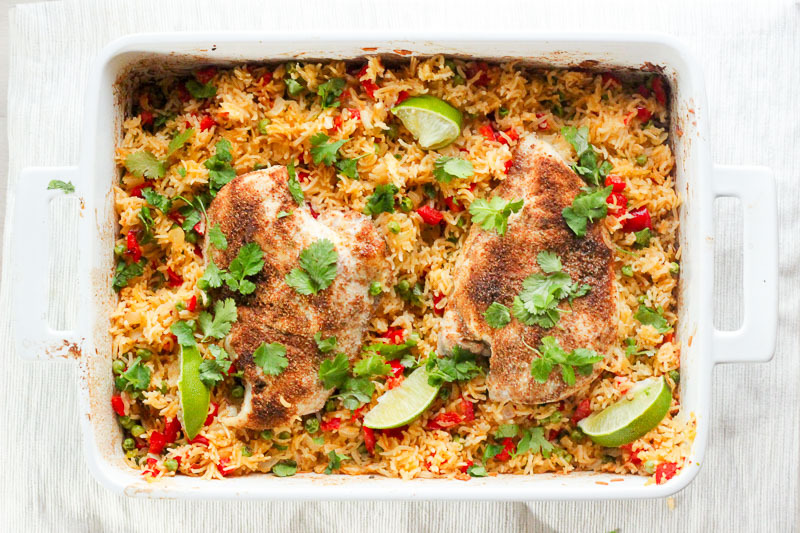 This Thai Chicken and Rice Bake is SO good, and one pan meals have really stolen my heart lately. 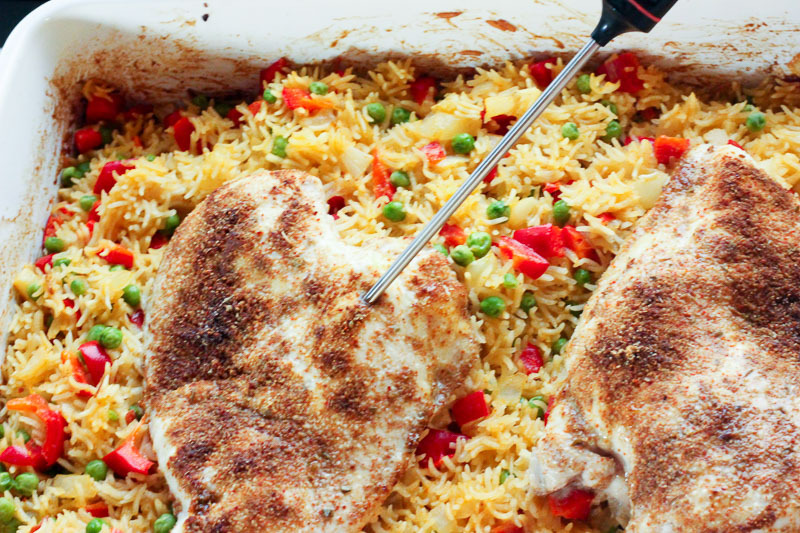 Almost a year ago I saw a recipe for a One Pan Chicken and Rice Bake over on the beautiful Recipe Tin Eats site. Right away I knew I had to try it, except that I wanted to turn it into a THAI Chicken and Rice Bake (well, Thai-inspired anyway – I’m not making any claims about the authenticity of this dish). Fast forward 9 months, and I finally got around to experimenting with it! This recipe is in the oven for quite a while, but almost all of it is hands off time. 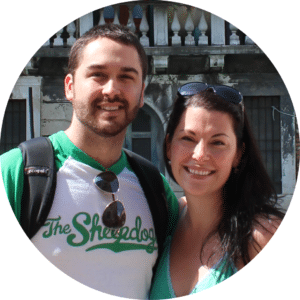 You should probably not go out to run errands (food in the oven, and all), but as long as you can putter around your house where you’ll hear the oven timer, you’re all set! 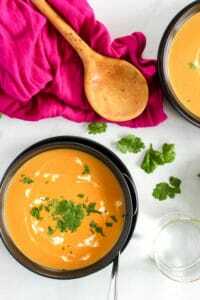 There are a few ingredients in this recipe that you may or may not have already, but the good news is they’re all excellent pantry staples or fridge staples that will keep a long time. Plus, I’m pretty sure this is the best rice I’ve ever eaten in my life. Yes. I know that’s a big statement. I actually hesitated before I wrote it. I’m not even the biggest rice eater and all I want when I make this is just to eat more of the rice. 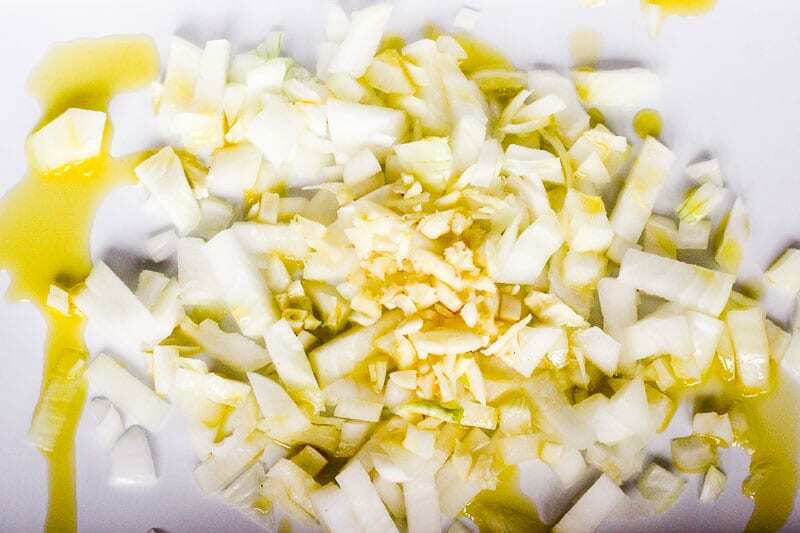 Preheat oven to 350 degrees F. Peel and dice one medium sized onion, and peel and mince 5 cloves of garlic. Put in a 9×13 casserole pan and drizzle with 2 tablespoons of olive oil. Stir together. Bake for 15 minutes, stirring after 12 minutes. While onion mixture is baking, mix together 1 cup chicken broth (I love Better Than Bouillon), 1 400ml can of coconut milk (I measured and there was 1+3/4 cup of coconut milk in the can) and 2 tablespoons of red Thai curry paste. 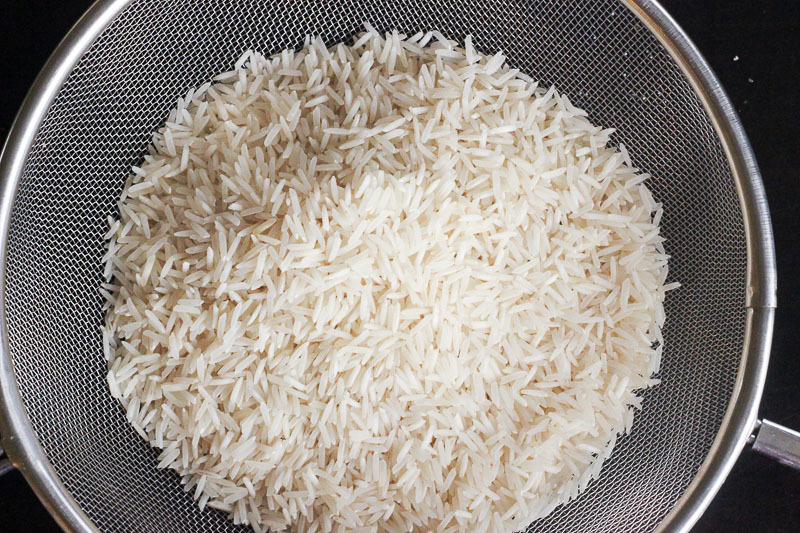 Rinse 1.5 cups of basmati rice very well. Add rice to onion mixture and stir well. Then add coconut milk mix and 3/4 teaspoon of salt. Stir very well to combine. Cover with foil and bake for 20 minutes. 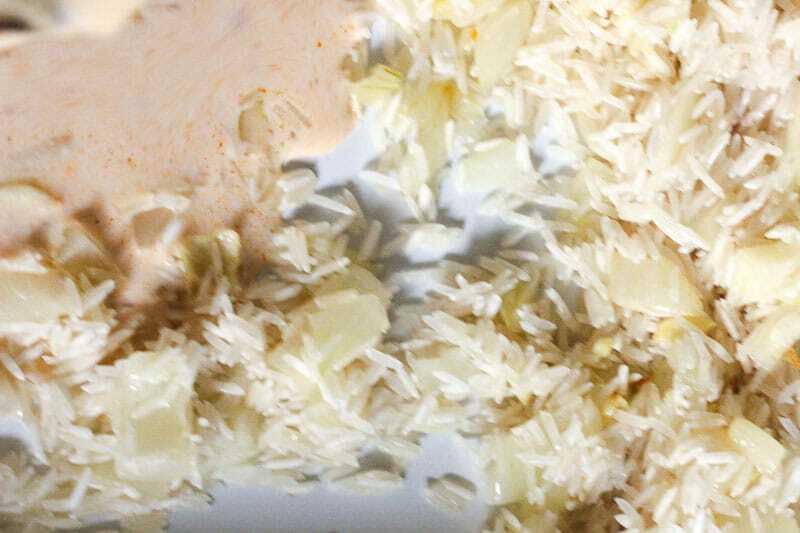 While rice is baking, prep your spice rub – 1.5 teaspoons of garlic powder, 1.5 teaspoons of ground coriander, 1/2 teaspoon of chili powder, 1/4 teaspoon of salt and 1/8 teaspoon of oregano. 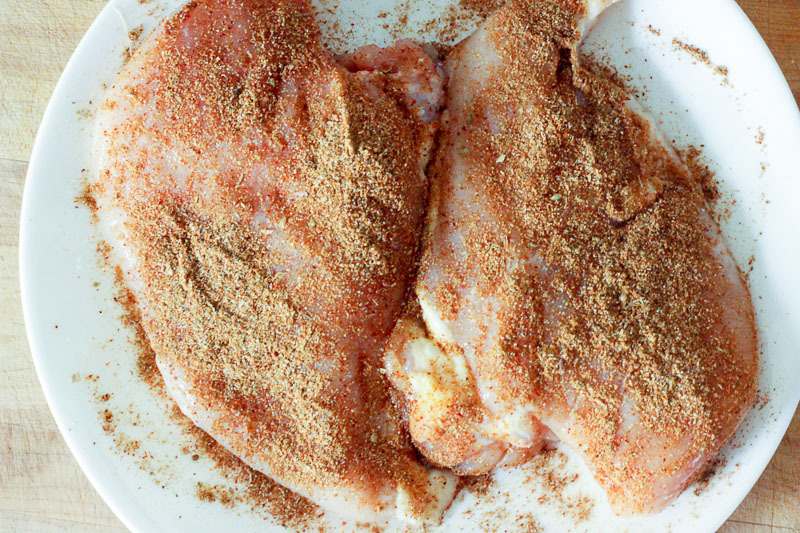 Pat chicken breasts dry, put them on a plate (top down) and sprinkle the rub onto the bottom, rubbing it in. Turn the breasts over the do the same to the top. Wash your hands super well. Dice one red pepper and get a cup of frozen peas ready. 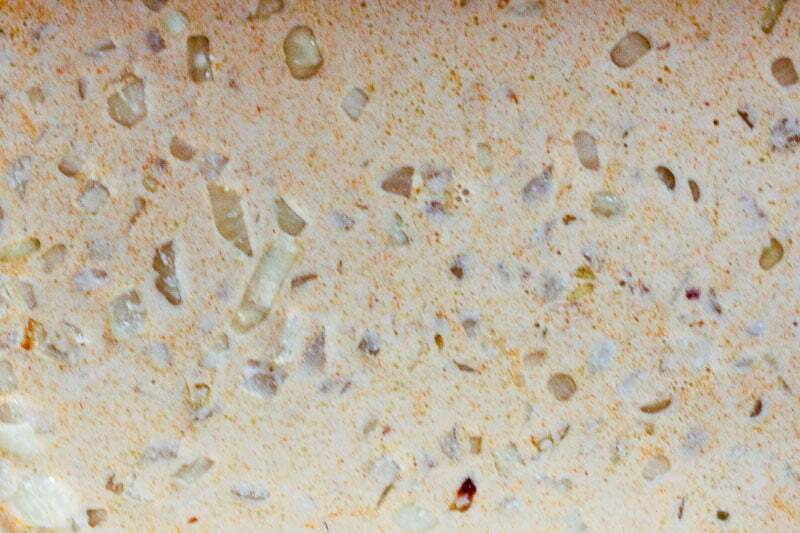 Mix vegetables into the rice mixture and stir really well, making sure you scrape the bottom and sides of the pan. Then nestle the chicken breasts on top of the rice. Cover with foil again and bake for 25 minutes. Then take foil off and bake for 15 more minutes. Take dish out and use a meat thermometer to test the chicken (you’re looking for 165 F). If your chicken breasts aren’t too big they might be done. If they’re really oversized they might need a few more minutes. Keep baking and checking until they reach 165. Let the chicken rest for a few minutes. In the meantime, squeeze half a lime over the entire dish and slice the rest of the lime into wedges to serve with it. Give the chicken a light sprinkle of salt and sprinkle some cilantro leaves over the dish. Slice the chicken and serve hot. 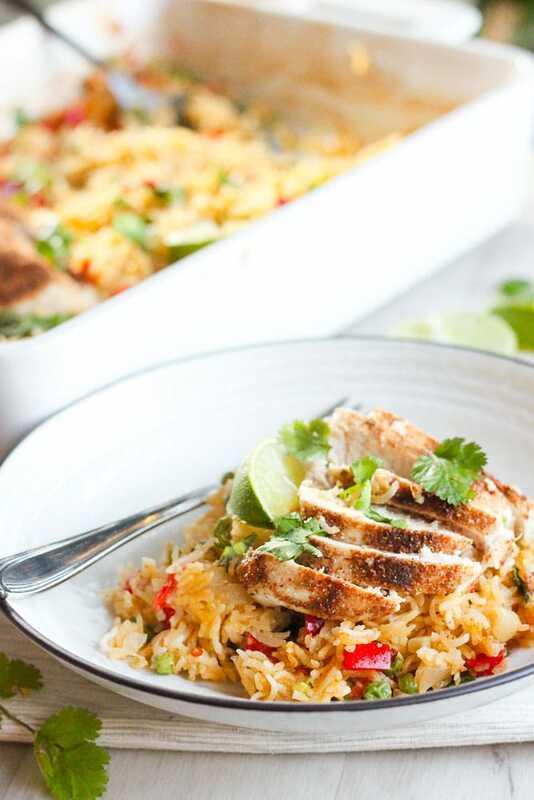 This One Pan THAI Chicken and Rice Bake is easy, healthy comfort food - one of the best meals for families, without a ton of dishes to clean! 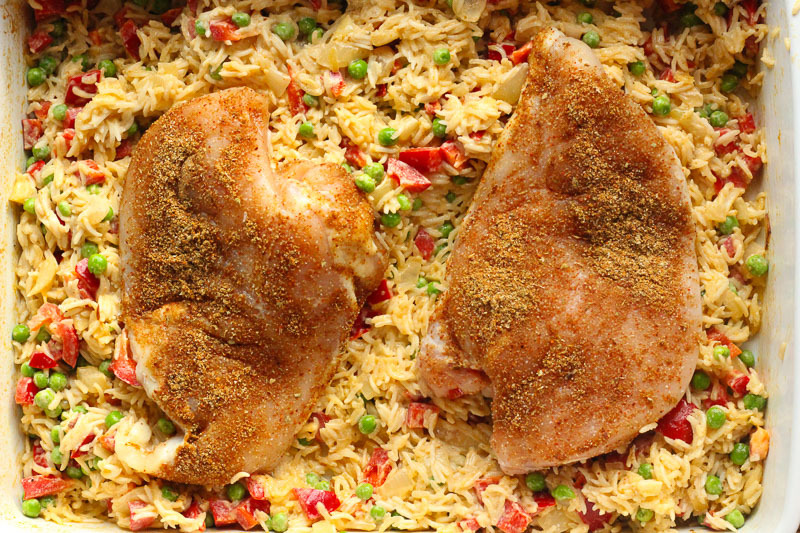 It'll become one of your favourite easy dinners! Also, it's the best rice I've EVER eaten! 1 small bunch cilantro optional but delicious! Preheat oven to 350 degrees F. Peel and chop onion and garlic. Scatter them in a 9x13 baking dish and drizzle with olive oil. 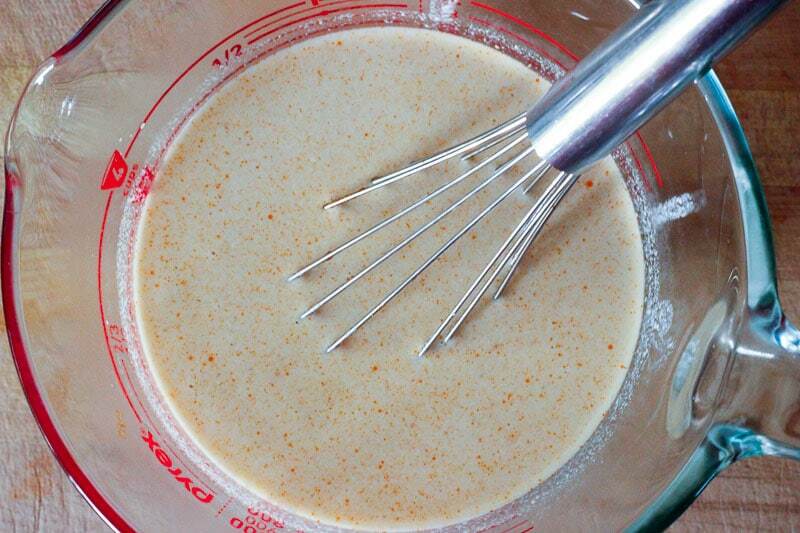 Mix well and bake for 15 minutes, stirring after 12 minutes. Meanwhile, mix together chicken broth, coconut milk and red Thai curry paste. Rinse rise in cold water. After onion mixture has cooked for 15 minutes, add rice and stir well. Then add liquids and 3/4 teaspoon of salt and stir well to combine. Cover with foil and bake for 20 minutes. 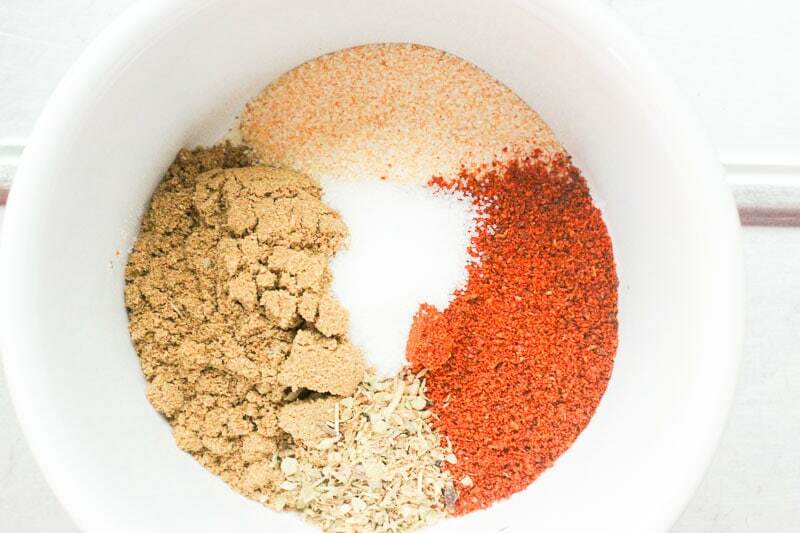 While rice is baking, mix the spice rub ingredients together. Pat chicken dry and sprinkle both sides with rub, gently rubbing it in. Wash hands well. 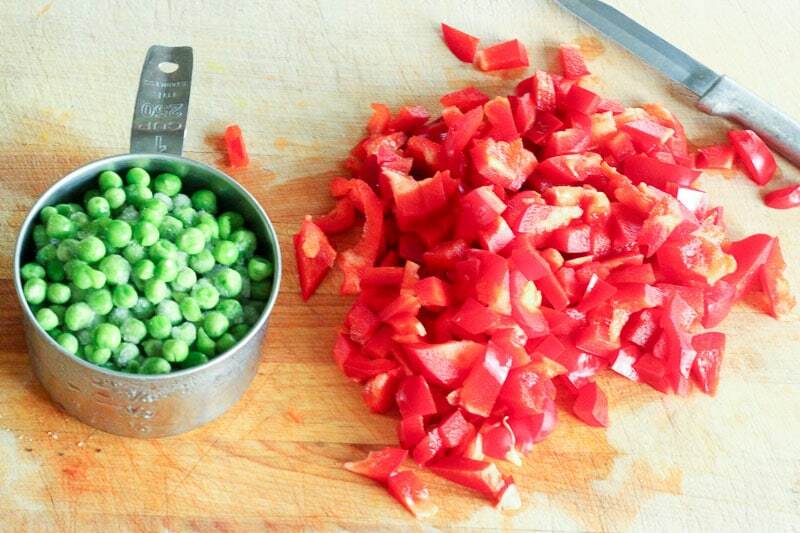 Wash, peel and chop red pepper and get peas ready. 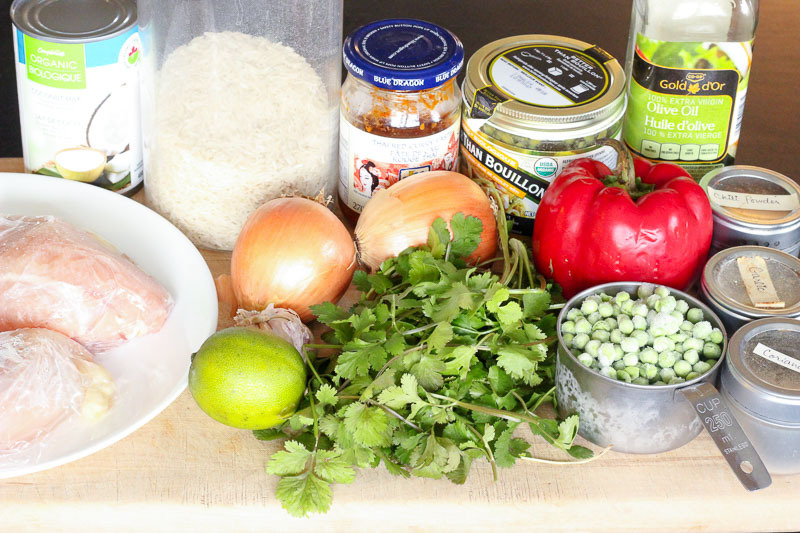 When the timer goes off, add peas and red pepper to the rice and stir it well, scraping the bottom and sides of the pan. Nestle chicken into the rice, cover with foil and cook for 25 more minutes. Remove foil and cook 15 more minutes. Check chicken with meat thermometer* (looking for 165 degrees). If chicken breasts are average size they will probably be done. If they're large they may need a few more minutes. Bake until 165 is reached. Take pan out and let chicken rest for a few minutes. Squeeze half a lime over the entire dish and slice the other half into wedges for serving. Sprinkle with cilantro. Slice chicken and serve hot. 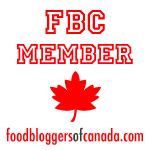 *I'm kind of obsessed with Meat thermometers. We own two! 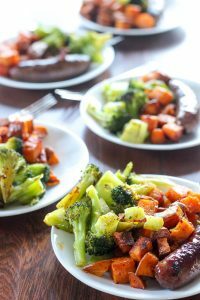 Do you have a favourite one pan meal? Let me know in the comments below. This might be my new fave! This is pure genius. 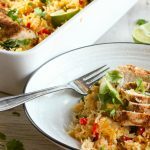 Chicken pad thai in a casserole-type version? I mean, really.. life changing. Cannot wait to try this! Oh I love pad Thai too! So much! 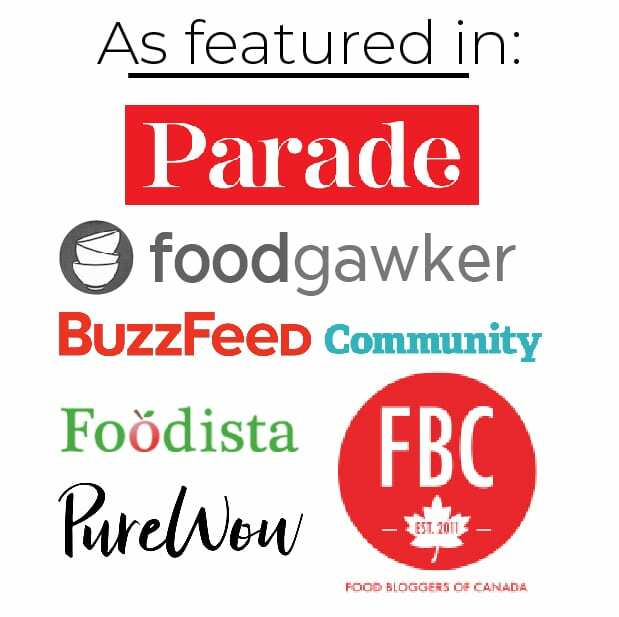 The flavour profile here is a little bit different, but still with that delicious Thai taste that I love so much (it’s the red Thai curry paste!). Yum! 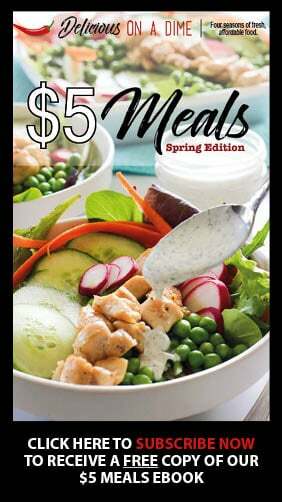 I cannot wait to try this dish!! I love thai! I’ll let you know how it turns out 🙂 thanks for the recipe!